The Kimilar compatible sensor bar can be used with Nintendo Wii and Wii U consoles, a great replacement if your original sensor bar is lost, broken or damaged. 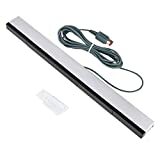 It works just like the original sensor bar with simple plug and play installation and does not require batteries or any power adapter. The motion sensor comes complete with a clear stand. The sensor bar can be positioned above or below the TV Set. Compatible with all Wii controllers including Wii U controllers, motion plus controllers and other Wii controller addons.